GRAND RAPIDS, Mich. – From apples to zucchini, buying Michigan-grown produce at the grocery store will soon allow participants in the Supplemental Nutrition Assistance Program (SNAP) to earn additional dollars for fresh fruits and vegetables at 17 Family Fare locations throughout Western, Southern and Northern Michigan. The Double Up Food Bucks program is a public-private partnership administered by Fair Food Network with support provided by federal, state and private sources. SpartanNash is the only major grocery retail chain with multiple stores participating in Double Up Food Bucks in the state, making it easier for store guests to take advantage of this program at multiple Family Fare Supermarket locations. The program is available from Aug. to Dec. 31 at more than 150 farmers markets and 34 additional grocery stores in Michigan, the majority of which are SpartanNash’s independent customers. For each dollar of fresh Michigan produce SNAP customers purchase at participating Family Fare stores using their Bridge Card and yes Rewards Card between Aug. 1 and Dec. 31, an equivalent amount of points will be earned and placed on their yes Card. Shoppers can then redeem the points at any participating Family Fare store for free fruits and vegetables. Each point is valued at $1, with a maximum dollar-for-dollar match of $20 per day on their yes Card. 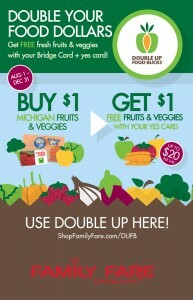 This is the third year SpartanNash has offered the Double Up Food Bucks program at select Family Fare Supermarkets. For 2016, the number of participating stores has more than tripled– up from two in 2014 and five in 2015. *Indicates a new store participating in the Double Up Food Bucks program. At participating Family Fare stores, fresh fruits and vegetables that are eligible for the Double Up Food Bucks program will be identified with Double Up Food Bucks signs. Michigan produces a wider variety of fruits and vegetables than any other state in the country, other than California. 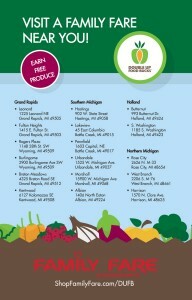 SpartanNash is proud to offer all customers, including SNAP customers, access to local Michigan fruits and vegetables. To learn more about SpartanNash’s participation in the Double Up Food Bucks, visit SpartanNash.com/DUFB.